On this page, we look at the USA’s contribution to international greenhouse gas sources and emissions, especially in relation to economic development. Note: This case study is restricted to the causes of the USA’s emissions. For more information about the USA’s strategies to deal with climate change, including reducing emissions, see the specific page under ‘Responses to Global Climate Change’ on this site. Los Angeles, USA: Transport is the US’s third largest cause of greenhouse gas emissions. Source: pxhere.com. No attribution required. 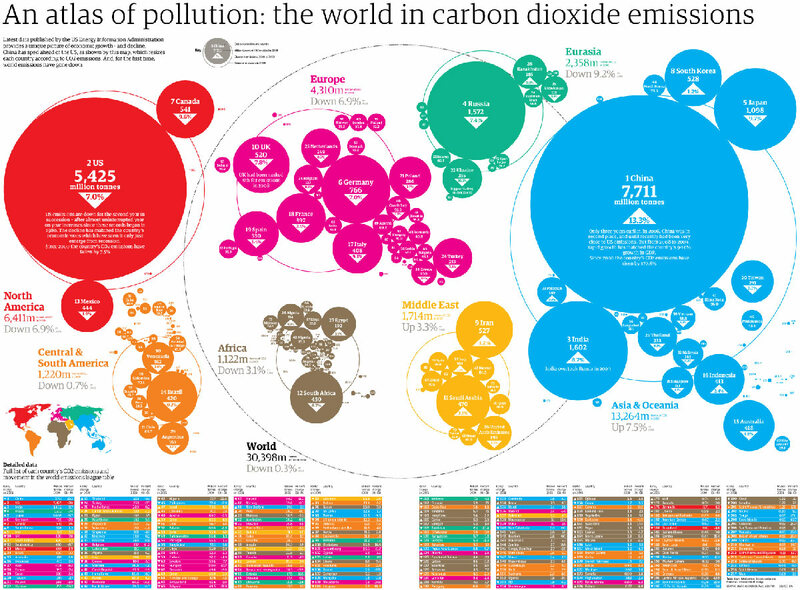 The US is the world’s second largest emitter of greenhouse gases after China, as shown in the graphic below. World carbon dioxide emissions data by country: China speeds ahead of the rest. Source: Guardian Datablog, 2009. Click here for full size image. The USA is the world’s largest emitter of greenhouse gases, but this must be put in the context of having a very large population. The per capita values show that although the USA is relatively high even per person, it is not in the highest bracket compared to some other countries. Worldwide CO2 emissions (metric tons per capita), 2014. Source: World Bank, 2014. The following table shows the USA’s per capita emissions compared to other selected countries. It reinforces the message of the map above, i.e. that per capita emissions are relatively high compared to some lower income countries. However, the countries that have higher per capita emissions are generally those with much smaller populations, much less land area, and very different economies. They also tend to be territories where air transport is significant, such as island nations. The US has experienced large variations in its emissions since 1960. A steep rise in the 1960s occurred as the country experienced strong economic development, with a sudden but short lived drop in the 1970s due to the oil crisis caused by the OPEC (Organisation of Petroleum Exporting Countries) decision to significantly raise oil prices from the Middle East. There has been a big drop since 2005, for two main reasons: firstly, as the US has moved away from coal as a major source of fuel and renewable energy has begun to be used for electricity generation. Secondly, the economic slump from 2008 onwards reduced consumption of energy. USA CO2 emissions (metric tons per capita), 1960-2014. Source: World Bank, 2014. Factors affecting US emissions. Source: Davis et a, 2015. A 2015 study found that the drop in emissions between 2007 and 2013 was not caused by a switch away from coal – that accounted for just 17% of the drop. The other 83% of the emissions fall was caused by economic factors, which were the direct result of the global financial crisis. As people had less money, consumption went down and fewer gases were emitted. In the United States, most of these gases are from transport, industry and electricity production, as shown on the graphs below. U.S. Greenhouse Gas Inventory Report: 1990-2014. Source: EPA, 2014. However, this amount is gradually decreasing as energy-efficient appliances are brought in, and the development of renewable sources for electricity, notably solar and wind power. The USA is a high income country (HIC) according to the World Bank’s classifications (World Bank Data Team, 2016). The gross domestic product (GDP) of the USA has been gradually rising and there is a correlation with the emission of greenhouse gases up until around 2005, at which point the economic growth continued despite a drop in emissions. US CO2 and GDP, 1950-2025. Source: Aden, 2016. Aden, 2016. The Roads to Decoupling: 21 Countries Are Reducing Carbon Emissions While Growing GDP. http://www.wri.org/blog/2016/04/roads-decoupling-21-countries-are-reducing-carbon-emissions-while-growing-gdp Accessed 8 February 2018. EPA [United States Environmental Protection Agency], 2014. U.S. Greenhouse Gas Inventory Report: 1990-2014. https://www.epa.gov/ghgemissions/us-greenhouse-gas-inventory-report-1990-2014 Accessed 8 February 2018. EPA [United States Environmental Protection Agency], 2015. Sources of Greenhouse Gas Emissions. https://www.epa.gov/ghgemissions/sources-greenhouse-gas-emissions Accessed 31 January 2018. EPA [United States Environmental Protection Agency], 2015b. Greenhouse Gas Emissions by Electricity End-Use. https://www.epa.gov/ghgemissions/sources-greenhouse-gas-emissions#electricity Accessed 8 February 2018. Guardian Datablog, 2009. World carbon dioxide emissions data by country: China speeds ahead of the rest https://www.theguardian.com/news/datablog/2011/jan/31/world-carbon-dioxide-emissions-country-data-co2 Accessed 2 February 2018. Pxhere.com, n.d. No title. [No attribution required.] https://pxhere.com/en/photo/622467 Accessed 8 February 2018. World Bank, 2014. CO2 emissions (metric tons per capita). https://data.worldbank.org/indicator/EN.ATM.CO2E.PC?contextual=default&end=2014&locations=KE&start=1960&type=shaded&view=chart Accessed 8 February 2018. Describe the global distribution of the countries with the highest total levels of greenhouse gas emissions.